There is something genuinely lovely about dining in the candlelit sanctuary of Bistro du Vin. It always manages to feel both comfortingly familiar and a little bit special; a rare find. Whilst I’m a Sunday regular in the bar that’s just a hop, skip and a jump (or occasional drunken stumble) across from Bistro du Vin, I’ve not dined in the hotel’s restaurant since January. Since that achingly cold winter night several things have changed at the hotel, including the arrival of a new manager and a refreshed Bistro menu. 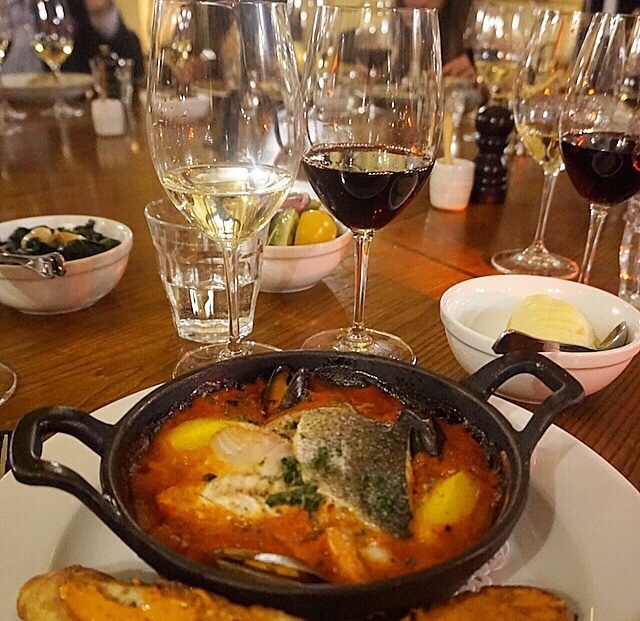 The promise of some classic French cooking was more than enough to lure me back into Hotel du Vin’s bosom, and from what I saw, ate and sipped it’s business as usual. And that business is proficient cooking and hospitality warmer than the electric blanket I regret not asking for at Christmas. After drinks in the Bubble Lounge, we moved to the bistro, being seated around a large table behind the sommelier station. Choosing a well-loved, classic starter can be hit or miss; pick a classic done well and it can form a memorable part of your dining experience. 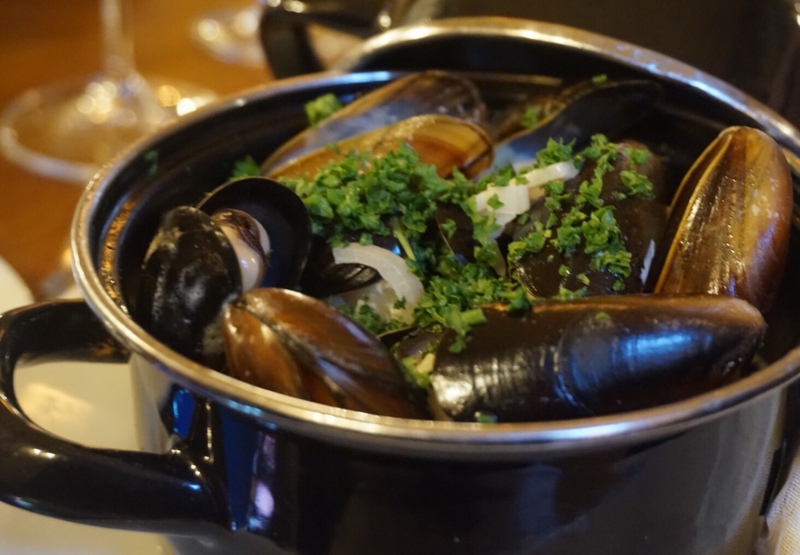 Moules Marinière (£6.95) is something I’ve enjoyed at the bistro before (albeit as a main course) and I was secretly quite pleased it had survived the menu update. 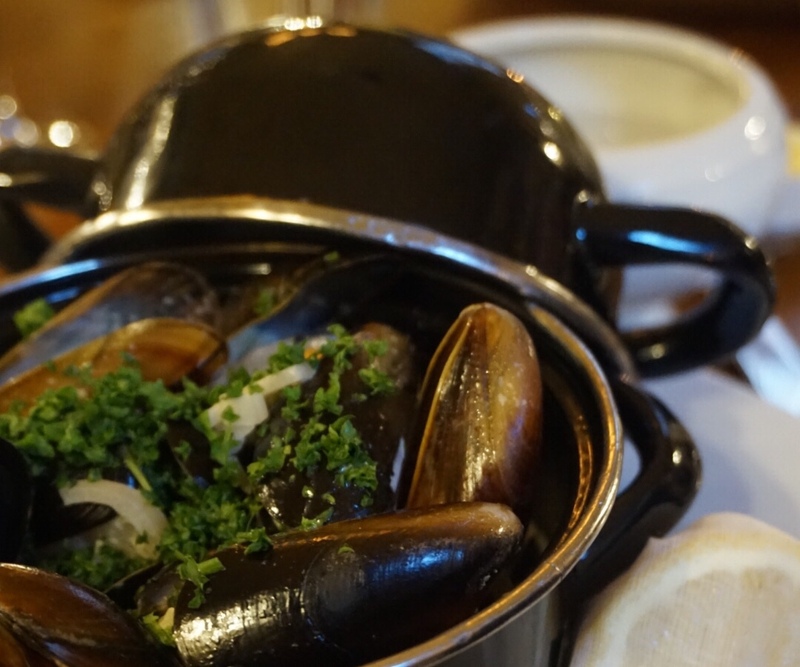 A more than generous portion of mussels come piled into an individual tin pot. Steamed with a splash of white wine, single cream, finely diced shallots and softened garlic, the mussels were juicy and plentiful. I did have several tightly closed shells which could have been removed before serving, but aside from that the flavours were on point, the meaty mussels were fresh, and the sauce was delicious. I dunked every piece of bread I could find to ensure the creamy liquor wasn’t wasted; my dedication to cream and garlic knows no bounds. 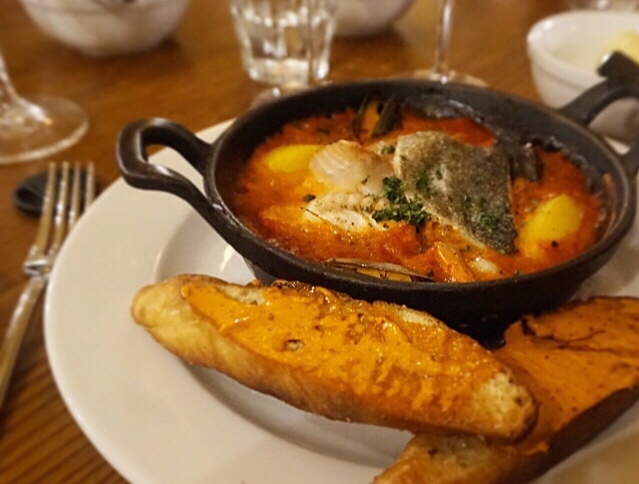 Having fallen in love with the fish stew when I visited Marseille in my teens, I was delighted to spot Bouillabaisse (£17.95) on the menu. 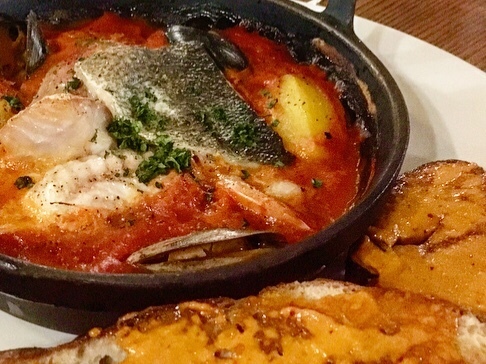 The bistro’s version of this provençal fish dish included pieces of monkfish, red mullet and seabass, as well as king prawns and mussels, in a rustic sauce infused with thyme and parsley. 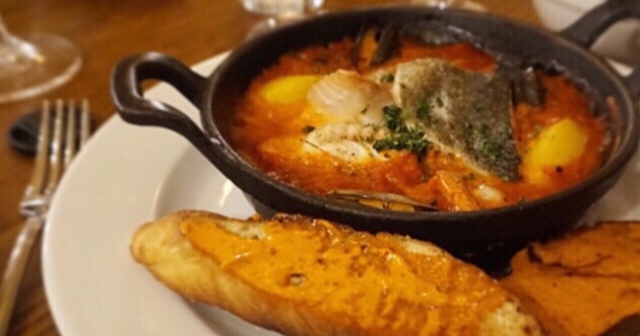 It’s a beautiful seafood showcase where the fish and shellfish proudly take centre stage, nestled in a thick tomato stew base. The sauce itself had delicate back notes of fennel, coloured like sunshine with saffron. It evoked memories and happily took me right back to being a sun-kissed 14 year old on my first school trip abroad. And that’s probably the biggest compliment I can give this incarnation of the dish. Confession time: I’ve had so many Creme Brûlées here over the years I may as well be one. I like that you get more surface area thanks to the wide dish and therefore more sugar crunch. 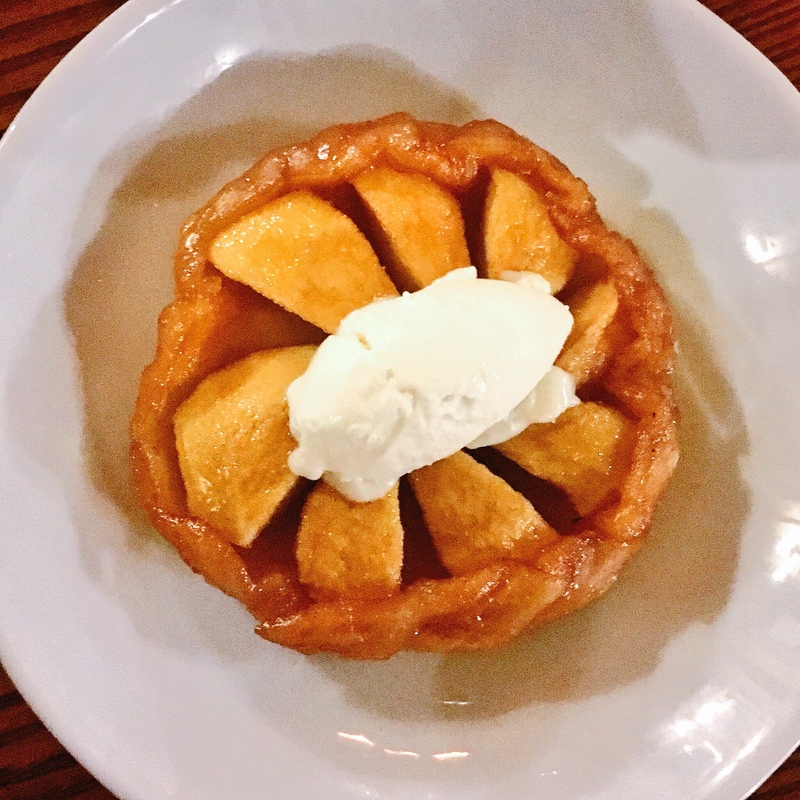 Holding this dessert in such high regard I was a bit dubious about trying anything else, but was finally tempted elsewhere on the menu to sample the Apple Tarte Tatin (£6.95). On arrival it looked inviting and homely, as it would if it was made in a country kitchen in rural France. Glistening homemade pastry offered buttery flavour, and supported syrup coated apple slices that retained some bite. 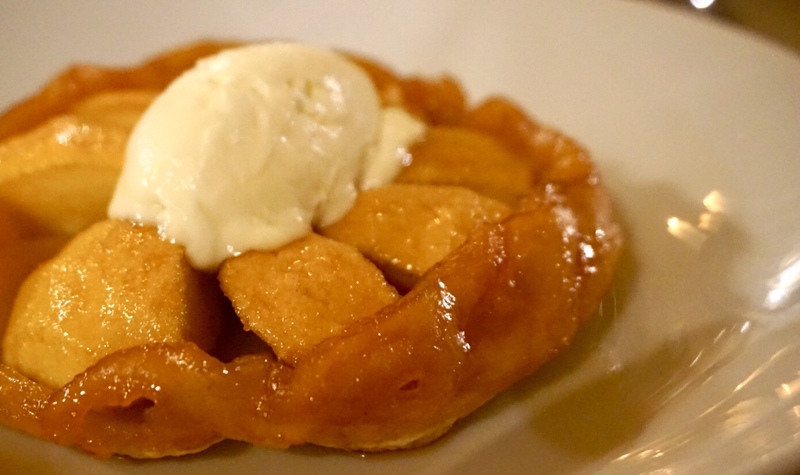 Served just warm, a dollop of creamy Crème Normande complemented the acidic apple and sweetness of the caramel coating. I was full but finished it all, refraining from licking the plate only because of the company. You’re welcome, guys. Alongside the food a selection of wine’s had been specifically paired, including the two available during Birmingham Wine Weekend; the Passori especially is delicious. When you dine next, ask to visit the sommelier station to choose your wine with expert advice. It’s a really nice touch and helpful if, like me, you like wine but aren’t an expert. If there’s one thing that I’ve experienced with each and every visit to Birmingham’s HDV hotel, bistro and spa, it’s a warm welcome. That’s what keeps me coming back time and time again. It’s why I prop the bar up most weekends; why I’ve eaten more bowls of mussels than is normal; why I have my nails done here even though it’s probably cheaper almost everywhere else. I can’t help but have a soft spot for this place; it’s consistent and runs like a well-oiled machine. Funny really, as that’s exactly how my husband described me when I fell through the front door after dinner..
Have you visited Bistro du Vin before? Do you like the venue and food? Let me know in the comments. 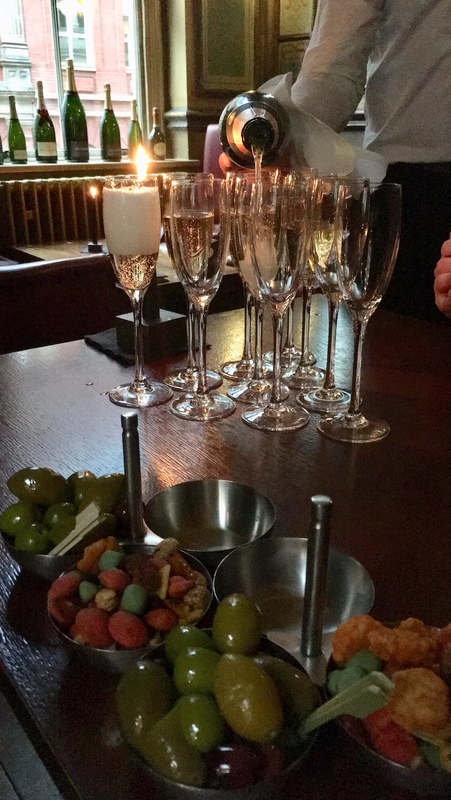 Disclosure: I was invited to try the new menu as a guest of Hotel du Vin Birmingham and Delicious PR. My meal, on this occasion, was complementary but all opinions, photos and hungover self pity are my own. Sounds lovely. Always enjoyed the food here, especially the mussels.